A drab lilac cap that becomes darker with age. 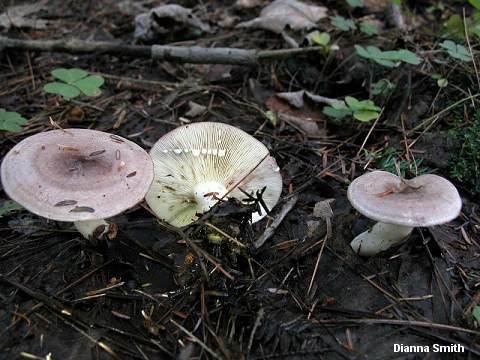 In eastern North America Lactarius uvidus appears to be associated primarily with aspens and birch, and its range corresponds roughly to the range of its hosts--although it is also reported under pines and willows in the Appalachian Mountains. 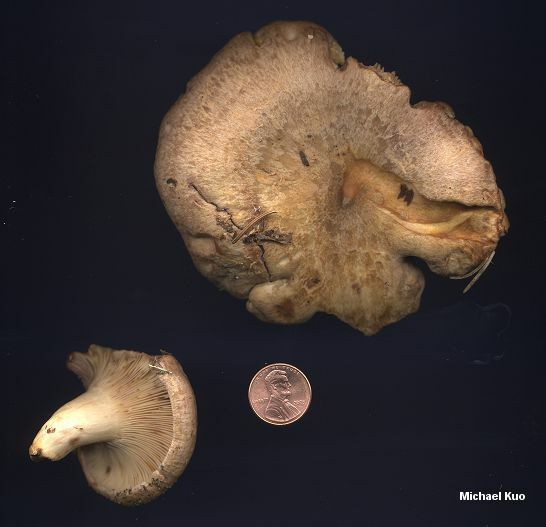 Lactarius uvidus var. 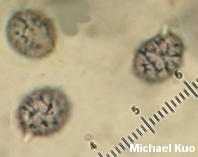 acystidiosus, described by Hesler and Smith on the basis of a Nova Scotian collection made under conifers, lacks macrocystidia and features slightly elongated spores. Ecology: Mycorrhizal with quaking aspen, big-toothed aspen, and birch (also sometimes reported under conifers); growing alone or gregariously; summer and fall; fairly common in eastern North America from roughly the 41st parallel northward, but also reported from the southern Appalachian Mountains. 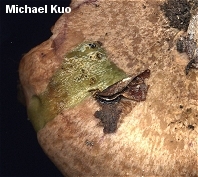 Cap: 3-10 cm; broadly convex with an inrolled margin when young; becoming shallowly depressed, with an uplifted margin; slimy or sticky when fresh; bald; purplish to pale drab lilac, darkening with age and often becoming lilac brown or merely brownish when mature; without zones of color, or with faint zonations. 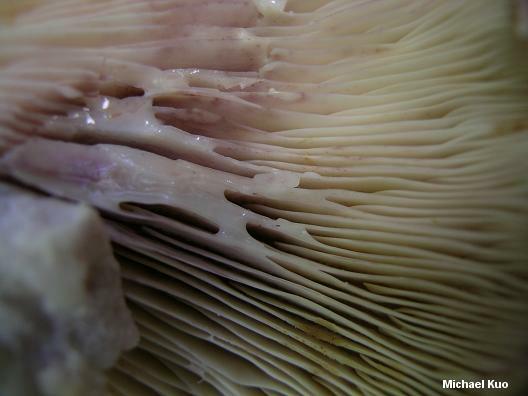 Gills: Broadly attached to the stem or beginning to run down it; close; white when young, becoming pale tan; staining and bruising purplish. 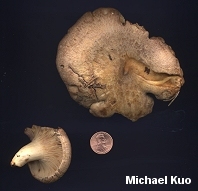 Stem: 3-7 cm long; 1-1.5 cm thick; equal; smooth (very rarely with potholes); slimy or sticky when very fresh and young, but soon dry; whitish; often developing yellowish stains, especially near the base. Flesh: White; firm; staining lilac when sliced. Milk: White, becoming creamy on exposure to air; staining all surfaces lilac. Odor and Taste: Odor not distinctive; taste mild or somewhat bitter (never strongly acrid). Chemical Reactions: Cap surface green with KOH. Microscopic Features: Spores 7.5-11 x 6.5-8.5 µ; broadly ellipsoid; ornamentation consisting of broad ridges extending 0.5-1 µ high; usually not forming a complete reticulum. Pleuromacrocystidia to about 80 x 10 µ; subcylindric to subventricose or fusiform. Cheilomacrocystidia similar. Pileipellis an ixocutis. REFERENCES: (Fries, 1818) Fries, 1838. (Fries, 1821; Saccardo, 1887; Kauffman, 1918; Hesler & Smith, 1979; Smith, Smith & Weber, 1979; Arora, 1986; Phillips, 1991/2005; Lincoff, 1992; Heilmann-Clausen et al., 1998; McNeil, 2006; Miller & Miller, 2006.) Herb. Kuo 09130408.